If you've got the connections, you can claim the streets. Sure, running around and intimidating people gets things done, but someone's got to be the brains behind the operation. There are two families wanting to own this same one street, and the first side to get themselves connected is going to win out. One problem - they've got your boss hostage, but then again - you've got theirs. 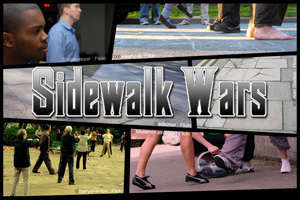 Sidewalk Wars is a game of strategy, quick footwork and even quicker wits. Suitable for all the family, especially Godfathers. Claire Bateman designs games and immersive theatre experiences under the name Minkette. Between now and graduating from the illustrious Central Saint Martin's College of Art & Design, Mink has had various interesting escapades with intriguing people. She won her first design award as part of the design team for the internationally acclaimed immersive-theatre company Punchdrunk for their production 'Faust' and later became a scenographer and then 'Mask Mistress' for the company. She started out her game design career making suspiciously ARG-like theatre with the mysterious Coney. Quickly followed by assisting the set-up of the first ever British pervasive Games festival Hide and Seek in 2007. Her street games have also featured in both the Come out and Play games festival and the NL:GD Festival of Games. After meeting Lost and Found she turned her hand to festival games and in 2008, created and ran the Games programme for the fledgling FarmFest music festival. As a Game Designer with Europe's leading ARG design company, Six to Start, she won three SXSW awards for game design, including 'Best Game' 2010 and 'Best of Show' 2009. Claire has created games for clients including Channel 4, the BBC, Disney, Penguin, the Science Museum (London) and Hodder Stoughton. She spends her spare time invading art galleries and the London Underground with her site-specific live-action radio-play.